Some time ago I was involved with an e-learning programme on coaching for the FA (Football, or soccer for US readers). I spoke to the guy a few years later who told me the programme had made a fortune for the FA, showing that branded, quality, niche, generic, e-learning content can make money. What was more interesting was his analysis of the ills in British football, exemplified by recent England performances. He explained that our heritage in sport was rooted in the public school system which valued 'games' but not 'practice'. To practice was seen as a form of 'cheating' old chap. So we like to play competitive sports, not practice to improve. This is so true. 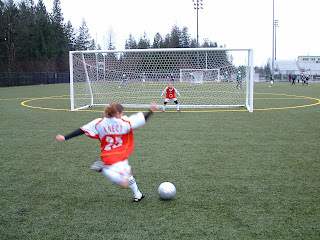 I've seen my kids get turned off football and rugby, despite being keen when younger, because it simply wasn't any fun playing on huge pitches with huge goals designed for six-foot goalkeepers. It was all about 'getting stuck in' with little real coaching. They gravitated towards Tae Kwon Do which is mostly practice, with occasional competitions, and flourished (for 4 years, four/five times a week, a clutch of medals, heading towards black belt next year). A further reflection was around the issue of homework. Most parents I speak to with children in the state system are shocked at the lack of homework. Perhaps this has its roots in the same culture, that practice is wimpish, only for swats, and doesn't matter. The students who do lots of homework are the students who do well academically, it's as simple as that. 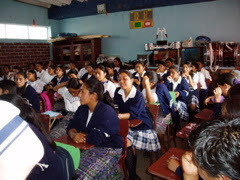 They learn how to learn and develop intrinsic motication and discipline around learning. These students often hide the fact that they do stacks of work at home, for fear of being ridiculed. They learn to keep quiet about doing homework. Homework creates autonomous learners. It teaches them to learn efficiently. It prepares students for the leaps from primary to secondary to tertiary education. It allows parents to contribute to their child's education and keep track of their progress. Looking back on my 50 years on this planet, most of what I learnt was in the quiet of my own room, not in classrooms. It's a shame that this valuable ethos is being abandoned. There is, of course, another reason for the collapse of autonomous learning (homework) - the teaching profession's obsession with classroom-only learning. Like full-size pitches in football, they're too big, anonymous, impersonal. They strip the fun out of learning. Educational theorists and practitioners can only think in the box, that box being the Victorian classroom. This is why the main investment in technology was in whiteboards. A more cynical observer would say they simply can't be bothered marking. Loved this site. Such a simple idea. 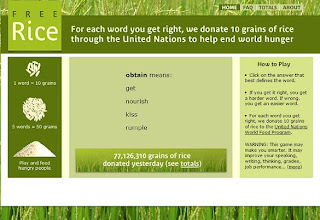 Answer questions, improve your vocabulary and help feed the poor. What's interesting about the idea is the fact that obne can link a simple learning game to a worthy charitable cause, killing two birds with one stone. Think what could be done of basic literacy and numeracy were tackled this way. Went to the Turner Retrospective at the Tate and had to laugh when I picked up The Guardian newspaper to see a full two-page colour picture of Damien Hirst’s latest megawork, ‘School: The Archaeology Of Lost Desires, Comprehending Infinity And The Search For Knowledge’. 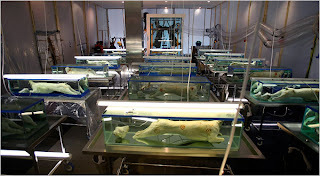 It’s a mock classroom with three ranks of 29 students as dead, decapitated, skinned sheep in formaldehyde. A single shark lurks at the back of the class. At the front is a huge towering tank with 10,000 litres of formaldehyde. Inside a white dove flies within a metal cage. On either side lie two halves of a sliced cow, some sausages, an old leather armchair (also in formaldehyde), cabinets of pills and drugs and an open umbrella. All bought for $10 million. So what of modern British art and school? Art is usually reactionary and irrelevant when it comes to education. Books, with their Harry Potter, Enid Blyton, Just William imaginary boarding schools, a million miles away from the reality of school for the huge majority. (93% to be exact). Theatre is just as bad with the awful The History Boys, replaying that old public school tale of extraordinary master and his boys. Imagine if the pederasty in that play had been included in a play set in a comprehensive. The movies are not much better with Dead Poet’s Society. The notable exception is the wonderful Ferris Beuller. Hirst’s is a working-class Leeds lad, with an ‘E’ in A-level art, rejected by every college he applied for he eventually got into Goldsmiths. His punky credentials are better than his education, a close friend of Joe Strummer and general bad boy himself, he really is a 21st century artist. I think he’s got this nailed. The loss of identity, uniformity, submergence and deadening of life the classroom. The sheer tedium of it all – an 11, soon to be 13, year minimum sentence. The religious imagery of the caged dove as the teacher caught in a pseudo-religious preaching role. The shark is the lurking bully and the ever-present air of frightening violence that is typical of the school experience. Like the students the teacher is merely a larger trapped, farmed animal. The classroom is the mortuary of lost desires. The search for knowledge only emerging after you recover from its leaden effect. Only a Hirst, a young working-class guy, could get under the skin of school in this way. If you’re in New York go see it – illuminated 24 hours a day and visible from the street. These are US for parents who hover constantly above their kids and intervene to help them solve problems. A survey of first <?xml:namespace prefix = st1 />year University students in the US showed that 40% of students had parents who directly intervened when there was a problem in their first year. About 13% of students said such intervention was frequent. Rather than being a break away from parental influence and control today’s kids seem to remain under their control for longer. This also seems to be true of kids at school, where staff are finding and increased and often intense interest by many parents in their children’s day to day activity in school. However, those students do get lower grades! On an entirely different note, students are spending the same amount of time studying as they reported in 2001, about 13-14 hours per week. That's about half the time faculty say they should be studying. What’s new! An interesting corollary, and perhaps consequence of this interest, is ‘boomerang kids’, who keep returning home for accommodation and financial support. I’ve never been one for self-help books, but this one kept on popping into my life. A personal recommendation, a review in a newspaper then a rave article in Wired Magazine. 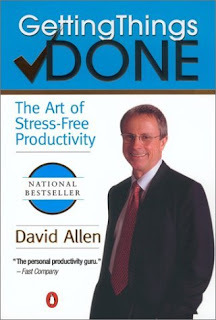 Forget the ‘things to do list’ (even with prioritised codes ABC), filofax, Outlook or time management courses – buy this book. Want to regain control of your life and the mess that is too much email, voicemail messages, piles of documents, endless work tasks and piles of bills to sort out. Or those movies you want to watch, books to read and personal projects whirling around in your mind. Allen calls all of this ‘stuff’, and he has a cure. Stuff is just stuff until you decide to act, so don’t manage stuff, manage actions. Clear the decks, get things off your mind. Lists and memory are both hopeless so Allen offers a neat one page algorithm, and amazingly specific advice. Think about what you have to do before you do it and don’t waste time on thinking about things you’re not going to do anything about for now. Capture and refine your decision making. To capture you’ll need collection buckets – in trays, electronic and paper (he’s no technology only geek). Have as few of these as possible and empty the buckets regularly. Everything goes into a bucket but nothing gets put back into a bucket. If NO a) trash it b) put it in a ‘someday’ folder c) archive as reference for retrieval when required. If YES, “Will it take less than 2 minutes?” If YES – do it. If NO, delegate or defer to a) delegate b) defer to a calendar or next actions folder. Off the side are larger multi-step ‘projects’ where you’ll need plans and separate folders. He gets practical on the need for folders, storage for physical files, a calendar and folders for actions. Review weekly from 10,000 ft, especially your action lists, and clean them up. You’ve got to close those loops. Buy basic tools – trays, folders, filing, elastic bands…. The real guts of the system is building your own ‘categories of action’ lists. My own happens to be; errands, home, computer, calls, travel, blogs, food/heath and leisure (films, books, websites, exhibitions and live events). In the end it’s all about habits, the habits of dealing with stuff without thinking. All I can say is it worked for me. The trick for me was the use of a paper diary for my ‘collection buckets’ and ‘action lists’. Go do it – order on Amazon NOW, or at least add it to your action list.